The largest of the 118 far-flung islands and atolls that make up French Polynesia, Tahiti seduces dewy-eyed newlyweds and loved-up couples with its silky white beaches, glistening South Pacific waters, repertoire of luxury resorts, year-round tropical sunshine, and beguiling culture. 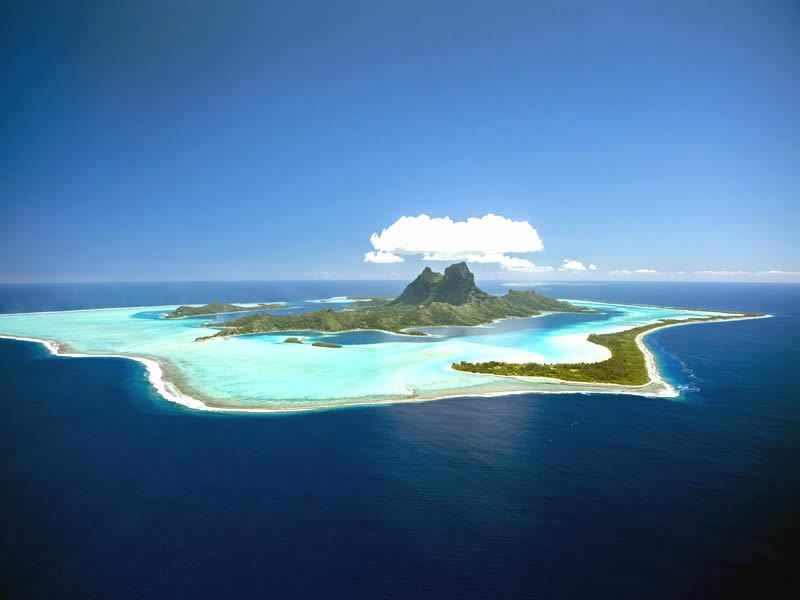 Located halfway Australia and California, it is part of what’s known as the Society Islands - an archipelago that is technically an overseas collectivity of France and also includes the islands of Bora Bora, Moorea, Huahine, Raiatea, and Taha’a. A land as enchanting as the frangipani necklaces you’ll be presented with on arrival, the main island of Tahiti is split in two halves: the larger Tahiti Nui in the northwest (home to the capital city of Papeete) and the smaller Tahiti Iti in the southeast. Both parts are volcanic - and what they lack in white sand beaches like neighbouring islands they make up for with colourful markets, photogenic interiors, and a wealth of cultural attractions. You can also expect all the romance of France - but with a backdrop of sparkling waters, blue skies, and fragrant flowers such as the signature tiaré (Tahitian gardenia), orchids, heliconia, and hibiscus blooms in palettes of yellows, oranges, pinks, and reds. Keep your eyes peeled for musicians in straw hats, dancers in grass skirts and coconut-shell bras, and Polynesian women with flowers in their hair (worn behind the right ear means single, worn behind the left ear means otherwise taken). While Tahiti and her islands promise enough blissful beaches and impossibly blue lagoons to keep you glued to your sunlounger for weeks, this is more than a fly-and-flop destination. Some of the most visit-worthy archipelago attractions include the Tomb of Pomare V, the Petroglyphs of Te Pari, Black Pearl Museum, and Point Venus - the spot where Captain James Cook recorded the planet transiting the face of the sun in 1769. For exciting Instagram fodder, be sure to visit The Three Waterfalls (known locally as Les Trois Cascades), the Blowhole of Arahoho, the Botanical Gardens, and the Magic Mountain. Honeymooners and couples wanting to make lasting memories can also go horseriding in the valleys, take seaplane or helicopter rides, learn to surf, and explore the numerous hiking trails. Another option is to book an inter-island cruise to visit more of the idyllic Society Islands (or travel by air if you’re stuck for time). Arguably the most romantic (and most beautiful) of the Society Islands, Bora Bora is the glamorous gem just a 45-minute flight west of the main island of Tahiti. A volcanic crater ringed by an inconceivably blue lagoon, it wows with postcard-perfect sweeps of pristine sand for hand-in-hand strolls, high-end accommodation (much is over-water), sunset cruises galore, and joyous views of Mount Otemanu towering in the distance. For adventurous couples, the waters are teeming with gigantic manta rays, sharks, colourful hard and soft corals, and more than 800 species of fish (you’ll spot whales if you visit between July and October). The lagoon is perfect for first-time divers as there are no waves or currents and the maximum depth is just 60 feet. For experienced snorkellers and advanced divers, there’s no shortage of operators offering detailed excursions (including special honeymoon packages) with PADI-certified professionals. 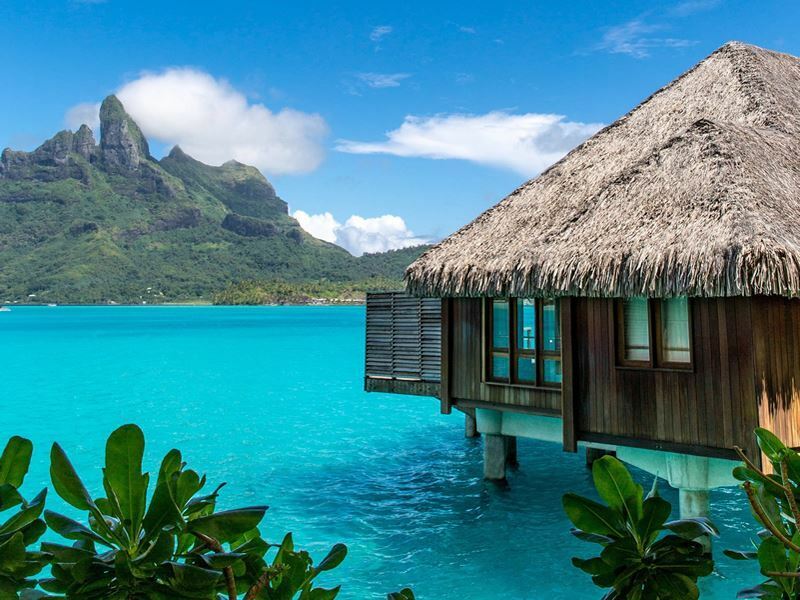 For romantics who want to whisked away to somewhere with jaw-dropping panoramas and phenomenally luxurious places to stay, Tahiti seals the deal (both Tahiti and Bora Bora were ranked the second and third best honeymoon destinations respectively in a recent poll by U.S. News). 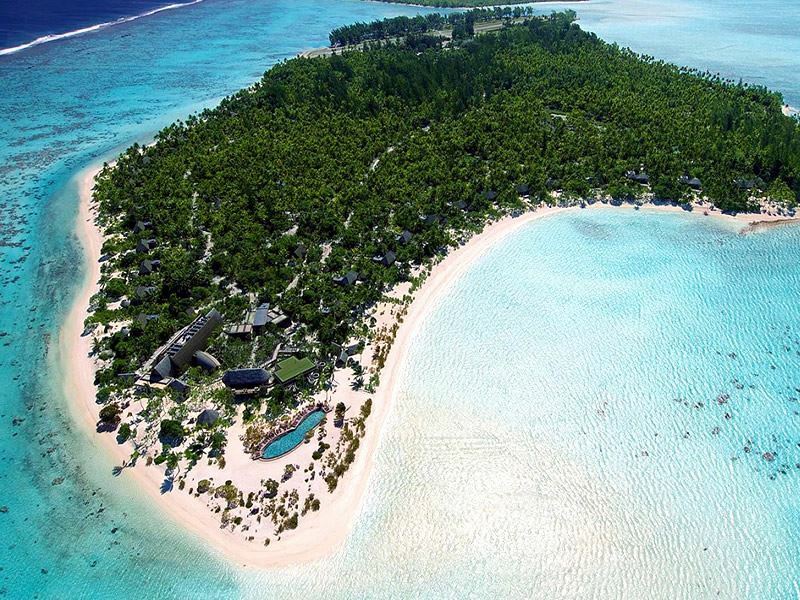 With the exception of Tetiaroa, every island offers a variety of accommodation; from upscale resorts run by well-known global chains to intimate boutique hotels and guesthouses. Read on to discover six desirable hideaways that all assure stunning surroundings, top-notch amenities, and friendly staff who will ensure that everything about your stay will be perfection. The stay: For old-school romantics and newlyweds kicking off their happy-ever-after, few places rival Marlon Brando’s ultra-polished retreat on Tetiaroa Atoll - a string of 12 low-lying islets framing a lagoon about 30 miles north of Tahiti. Nicknamed the godfather of island escapes (the actor fell in love with it after scouting for film locations for Mutiny on the Bounty in the 1960s), this has become a much-loved playground for presidents, royals, and celebrities since opening in 2014. There’s just 35 standalone one, two or three-bedrooms villas, all with a private pool and beach area, comfortable king-size bed, living room, media room, outdoor dining area with beanbags and daybeds, and bathroom with deep-soaking tub (some also have a kitchen). All look out to the pristine white sands and come with free-to-use bicycles for exploring the island. Privacy is paramount - the accommodation is so spread out you may not see another soul. The romance: The down-time starts from the second you’re driven to your sumptuous villa - and continues throughout your stay. Expect mood-setting luxuries throughout, including two excellent restaurants for French cuisine or Polynesian fare, a bar with delightful treetop seating areas, and a gorgeous spa with divine treatments and therapies in addition to a steam bath, waterfall, and tea lounge. There’s also heaps of activities, such as snorkelling in the coral gardens, deep-sea fishing, and exploring the spectacular lagoon or other motus (islands) by Polynesian outrigger canoe, kayak, or paddleboard. Twosomes preferring to stay on dry land can enjoy bird discovery tours, nature trails, and visits to the island's impressive eco-station. The stay: Offering heart-stopping views of Bora Bora’s iconic Mount Otemanu, this 44-acre resort featured in the 2009 film, Couples Retreat. 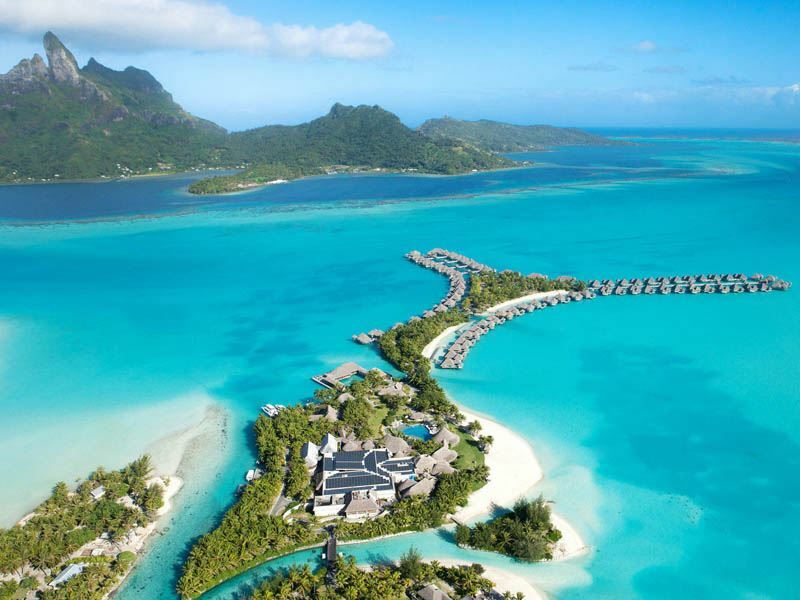 Set along the island’s northern coastline and surrounded by a beautiful lagoon and the turquoise-tinted ocean, it ticks the paradise boxes for romance and relaxation; not least for its ocean-floating accommodation (it was among the first properties to unveil over-water bungalows to the rest of the world). All of the stylish and spoiling villas up the romance factor with bespoke Polynesian artworks, comfortable king-size beds with crisp white linens, flatscreen TVs with digital channels, generous indoor and outdoor living spaces, and bathrooms with sunken tubs and walk-in showers (some have private pools lined with white glass tiles). Best of all, you’ll also be assigned your own personal butler who will take of care of anything and everything you need at any time, day or night. The romance: In addition to four restaurants offering a choice of Japanese, Italian, and French or Polynesian cuisine, there’s two pools (one for grown-ups), a private lagoonarium with sparkling coral blocks and a dazzling collection of fish species, and three pristine beaches. Also standout is the state-of-the-art gym for its Technogym equipment and the 13,000-square-foot Miri Miri Spa by Clarins for its treatment rooms and separate changing areas with saunas, steam rooms, and whirlpools. There’s also a wealth of exciting experiences for those seeking together time, including stand-up paddle boarding and kayaking at the Main Beach, scuba diving, snorkelling, jet skiing, deep-sea fishing, 4x4 adventures, private boat charters, and lagoon tours. The stay: Love is in the air at this Relais & Châteaux-approved couples’ haven on Motu Tautau, the secluded coral-sand islet off the west coast of the vanilla-scented Taha’a (just 10 minutes from Bora Bora by helicopter). Not only has it scooped its share of industry honours, but it’s also made it onto Condé Nast Traveler's GOLD LIST for The World's Best Places to Stay. 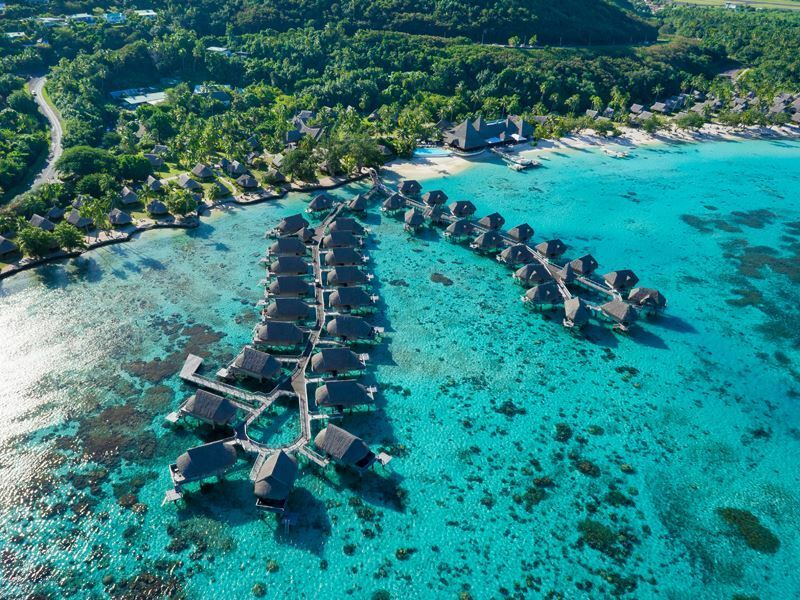 Perfect for those on a go-slow, it connects guests to nature and the traditional culture of the island with stylish villas and over-water bungalows built with local materials such as thatch, coral, and bamboo. Clever design touches include glass panels at the end of the bed offering underwater views, private wrap-around sundecks, and direct lagoon access. For deeper wallets, the larger signature beach villas offer more solitude and feature private walled gardens, pools, cabanas, outdoor bathtubs, and close-up views of the brilliantly blue Pacific Ocean. The romance: The sweet scent of vanilla sets the tone for the lovey-dovey trimmings and trappings that follow. There are plenty of amorous ways to fill your days: private picnics, candlelit romantic dinners with champagne on the beachfront, trips to working pearl farms, and swimming in the warm waters of the turquoise lagoon that Taha’a shares with its sister island, Raiatea. Elsewhere, there’s three restaurants for French, Polynesian and international cuisine, two bars for anytime drinks, an outdoor pool for daytime lazing, and a gym with advanced cardio equipment. For bliss-you-out pampering with flower-infused coconut oils, the lagoon-facing spa is nestled in an exotic garden surrounded by bamboo trees. The stay: Perfect for those seeking a post-wedding getaway or couples’ escape that’s all about relaxing, this Polynesian-style resort is set on the gorgeous coral islet of Motu Tevairoa - only 15-minutes across the lagoon from the village of Vaitape. Offering some of the most traditionally designed accommodation in Bora Bora, you’ll find a superb variety of rooms and villas nestled in beautiful tropical gardens or directly on the beach. For upping the ante in the romance stakes, there’s also over-water bungalows suspended above the shimmering lagoon and large suites with Jacuzzi tubs and incredible Mount Otemanu views. All have been designed with indoor-outdoor living in mind and feature flatscreen TVs with digital channels, free Wi-Fi, comfortable king-size beds, safes, and well-stocked minibars. Bathrooms have separate bathtubs and showers and luxe toiletries (some have additional outdoor showers). The romance: Everything at this intimate and sophisticated resort will spark joy for romance-seekers. Spend your days getting stuck into stand-up paddleboarding, kayaking, canoeing, and snorkelling - or enjoy tennis, mini golf, table tennis, volleyball, and pétanque. There’s also an air-conditioned gym and a decadent spa with a wealth of ancient and modern beauty rituals to soothe your body and mind. The resort has three restaurants, one bar, and a round-the-clock room service menu (those staying in an over-water bungalow or suite will have breakfast delivered by outrigger canoe, weather permitting). For the ultimate love-you-to-the-moon-and-back gesture, candlelit dinners on the beach can be arranged. 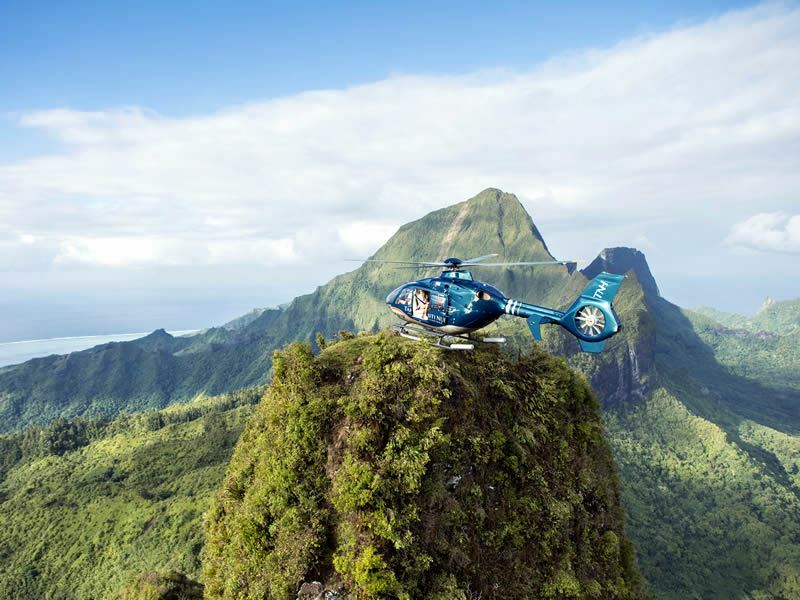 The stay: Loved-up honeymooners and romantics can expect gracious Polynesian hospitality and dreamy surroundings at this classy resort on Moorea - Tahiti’s sister island that’s most famed for its forest-covered mountains, green spires crowned by clouds, tumbling waterfalls, peaceful meadows, and bright blue lagoon. There’s a series of over-water bungalows (all with ladders for direct water access) as well as many more beach and garden bungalows facing the island's longest stretch of white sand. All have a unique blend of classic French décor with contemporary Polynesian design accents, bright colours and precious woods, free Wi-Fi, tea and coffee-making facilities, air-conditioning, and sliding glass doors opening onto furnished terraced. All bungalows have generous bathrooms with fluffy towels and French toiletries. The romance: The resort makes the most of its magical setting with plenty of secluded spots for gazing at birds of paradise and cosying up to watch the sun dipping over the Pacific Ocean. Facilities include two restaurants that both host Polynesian dance shows, two bars for tropical cocktails, an elegant spa for top-to-toe pampering with local oils, and a private beach. Unsurprisingly, most of the activities focus on the water: there’s an in-house diving centre for couples interested in the island’s rich marine life, opportunities to swim with whales and dolphins (season depending), and exciting watersports such as windsurfing, jet skiing, and sailing. Full-day island excursions, either to the lagoon or to the mountains, can be arranged. The stay: With all the ingredients to live la vie heureuse (a happy life), this frontrunner is unique in that it caters to a maximum of 16 guests at any one time. 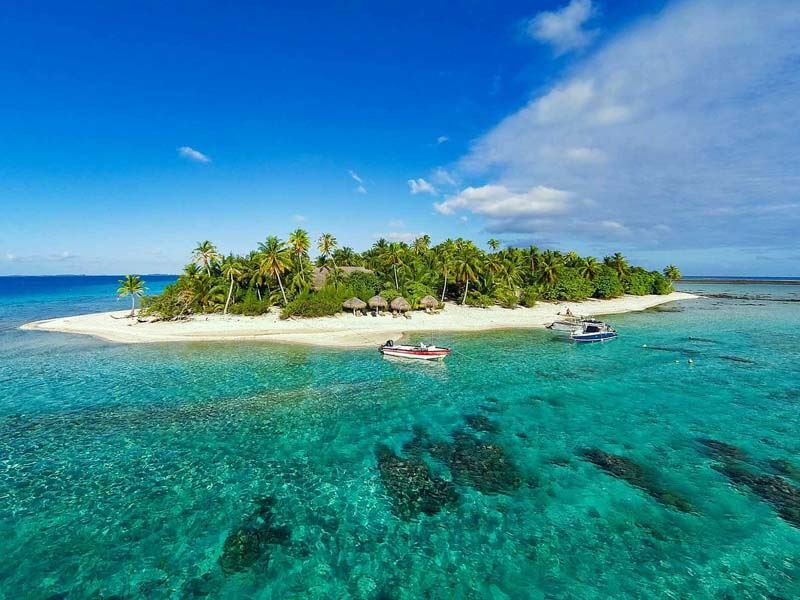 Hidden away on a motu in the southwest corner of the French Polynesian atoll of Tikehau, it serves as the perfect launch pad for divers, anglers, kiteboarders, surfers, paddlers, and swimmers who are happy to let the tropical waters take centre stage. There’s just seven rustic, handcrafted, and individually-designed bungalows - all featuring walls inset with local coral, staircases carved from local trees, and roofs thatched with coconut palms. Guests can expect cosy living areas, bedrooms with plush beds, and stunning vistas from all around. And given that the entire resort is ‘off the grid’ (it generates all its electricity through solar power and there’s no TV in the bungalows) you’re forced to enjoy a digital detox (but if you’re struggling you’ll find one in the lobby - and Wi-Fi too). The romance: Couples who want to do little more than soak up the castaway vibe, relax by the crystalline lagoon or the lovely white-sand beach, and linger over meals prepared with fresh, seasonal, and organic ingredients will end up never wanting to pack their suitcases and leave. The water-orientated activities are outstanding (the owner frequently takes guests deep-sea fishing), but there’s also gentler pursuits too, such as visits to the local organic farm, bike tours, and day trips to the mainland of Tikehau. You’ll also have the bonus of staying somewhere so intimate that you can choose to keep to yourselves or socialise with other guests.